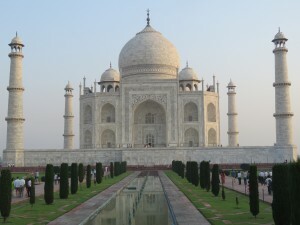 As promised in our last blog, here are pictures from the world’s most photographed building – an architectural masterpiece – a World Heritage site – one of the Seven Wonders of the World and one of India’s biggest treasures – the Taj Mahal. 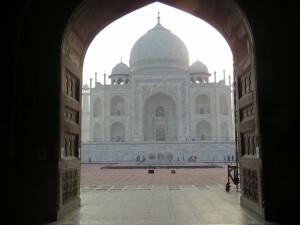 In addition to being an exquisite sight to behold, the Taj Mahal is also an eternal love story for the ages. 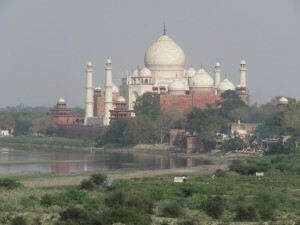 Shah Jahan of Agra built the majestic tomb for his wife Mumtaz Mahal who died giving birth to their 14th child. It is said he was so heartbroken after her death that he ordered the entire court into mourning for two years. He then built what is considered the world’s most beautiful monument to hold the tomb and the memory of his beloved. It took 22 years and 22,000 workers. 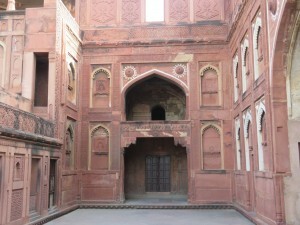 Near the gates of the Taj Mahal is the 16th century monument known as the Red Fort of Agra. The Red Fort is a palatial walled city that houses many spectacular palaces within made of both red sandstone and white marble. 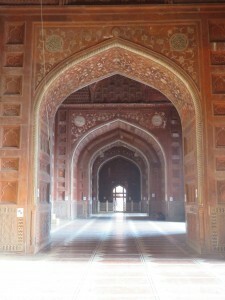 I loved the majesty of the Red Fort almost as much as the Taj Mahal. 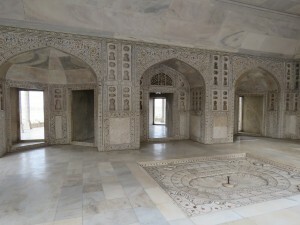 Eventually Shah Jahan, who built the Taj Mahal, was imprisoned in the Red Fort by his son who thought the Shah was unfit to rule because of the money that was spent on this massive project. Alas, at the end of his life, the Shah could only view his beloved’s tomb from the balconies of the Red Fort. He was never able to visit her again. Yet ultimately he was buried next to her in this great tomb upon his own death. I saw the Taj Mahal for the first time 27 years ago. It was the most magnificent building I’d ever seen. From every angle and from any distance it took my breath away. It still takes my breath away! It did not disappoint me this trip. Yes, there were more people, security, and areas blocked off, but the Taj continued to dominate the land and show it’s various colors as the sun rose and played on it’s marble exterior. And the detail up close – amazing! 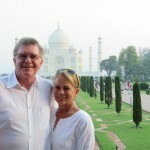 The Taj Mahal is the ultimate love story and I was looking forward to sharing it with Kathy who is the love of my life. It was a very romantic day and one I will remember for a long time. So what do I bring home with me from this pilgrimage? Gratitude. Realizing how privileged I am to be living in the US and realizing that most of my problems are small and manageable compared to what I have seen over the last six weeks. Family and Friends. Nothing is more important. I missed my family and friends in the US a lot. But I also made a number of new friends on this trip that touched me very deeply. They made this trip very rich. Happiness. The people of Bali and India showed me that happiness is more an attitude and a choice rather than an accumulation of things. Spirituality. There are many paths to God and there are many ways to live. It’s a big, complicated wonderful world filled with a lot of good people. We left beautiful Agra with it’s majestic monuments and thousands of tourists to return to Delhi one more time. We’ve been back and forth to Delhi so many times on this trip that it was beginning to feel like home to us – which is funny because there is nothing about Delhi that is familiar to our world here in California…at all. India is about as far away from our day to day reality as it gets. But that’s the point of a pilgrimage. The result of all travel is to leave the known for the unknown, to leave your comfort zone, to open oneself to new experiences, to learn something new, and to grow into a larger life and a larger world. I believe all travel is spiritual pilgrimage because it causes us to see the world, others, and ourselves in new and different ways. It teaches us that there are many, many ways that life is lived on this planet. From these types of travel experiences, our hearts and our minds expand. We become citizens of the world, members of a shared humanity that cross all cultures and geographies. We begin to see each other simply as people, no matter how different we may seem. We begin to care about parts of our human family that we didn’t even know about before. This was our intention for this pilgrimage. We wanted to be reminded that this is a huge, huge world. We wanted to be shaken out of our complacency and any narrow mindedness about life. We wanted to see life in all it’s colors, shapes, and smells and to try to love and appreciate all of it – from the smiles of the Balinese people – to the deep spirituality of the holy men on the Ganges River – to the beggars on the street. We want to remember all of it. We are so glad to be home. We are so glad to have the life that we have. And we never want to forget this. This is the final stage of a spiritual pilgrimage – reflection and integration. How do we keep these fresh new awarenesses alive in our daily life back at home? How do we stay awake to the similarities and the differences we found on the other side of the world? How will these new perspectives affect how we live our lives? How do we stay humble and grateful for all the graces we have? This is the ongoing work that happens after the travels end. The unpacking from this journey will continue for quite awhile. And I’m sure the gifts of this journey will keep coming. We have loved sharing our experiences with you. Writing this blog has been our way of bringing even deeper meaning to our trip. We know most of you can’t be on a trip like this right now and some of you may never be able to physically visit Bali and India. It is our prayer that sharing this journey gave you the opportunity to be on pilgrimage right along with us. We hope that through our sharing you too have been cracked open a bit and have maybe become more aware and accepting of life and humanity around the world because of our journey. Thank you for being with us. We have appreciated all the kind words of appreciation and the support. When you’re far away from home, it always helps to know there are people thinking of you and pulling for you. And believe me, we felt the love. We hope you enjoyed the ride. Til next time, may we all travel well on this ultimate pilgrimage – the journey of a lifetime. This entry was posted on Wednesday, April 8th, 2015 and is filed under Bali, Hinduism, India, Journey, New Delhi, Red Fort, Spiritual Journey, Spiritual Pilgrimage, Travel blog, Uncategorized. 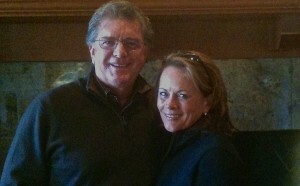 Mike, Kathy – thank you for taking us on this spiritual journey with you. I can’t believe its already over (or is it just beginning?). Thank you for sharing your thoughts and making me aware how blessed I am for all that I have. Glad you both are safe home. I enjoyed reading these reflections of your trip. I shall reflect on these words today, as I will never make that journey. Not in my life plan. Welcome back home to California,my home state. I loved to travel with you on your beautiful spiritual journey. From my work office I wans able to be transported for a few minutes to the outside world and expand a little. Sharing your experience brought me joy and broadened my knowledge of other places. Thank you both for sharing your experiences and beautiful pictures! Happy that you have returned safely. Rest and reflect! Welcome home neighbor! Looking forward to a face-to-face sit-down with a bottle of wine to hear more stories. New Zealand and/or Italy……next adventures?? Thank you so much for sharing your wonderful experiences and insights. It is good to have you back! Happy to have you back stateside and thank you for sharing your journey yet again. It seems that you must have learned many valuable lessons and I look forward to seeing what is next for the two of you! Thanks for sharing your heart and fresh view of the planet. Inspiring. For us, Bali is a yes. India not too soon. Will let you know if we pull together plans for a CA visit to see family. Thank you so much Kathy and Michael. So glad to be part of your Bali journey and to read about your adventures in India. Hope to cross paths again one day — in CA or who knows where! Here’s to enjoying the journey. I am so grateful for the traveling news and think of you often. May our paths cross again.